HOW DO I KNOW IF I’M CLENCHING AND/OR GRINDING? Clenching and/or grinding habits can be difficult to self-assess. Checking in on the position of our teeth during high stress activities, like driving through traffic, can give us an idea of whether or not a habit is present. Those familiar with yoga may have heard their instructors encourage them to relax their jaw and separate their teeth during challenging poses. Until this instruction is given, many students may be unaware they are clenching. Self-assessment of clenching and/or grinding habits at night is even more challenging, however, there are a few symptoms we can watch for. One symptom is soreness or stiffness in the jaw first thing in the morning. It may seem like eating breakfast takes a little more conscious effort, as if the muscles need to be stretched. Another symptom is sensitivity in the teeth that goes away as the day progresses. Sometimes a headache or neck soreness may be present. HOW DOES THE DENTIST KNOW IF I’M CLENCHING AND/OR GRINDING? 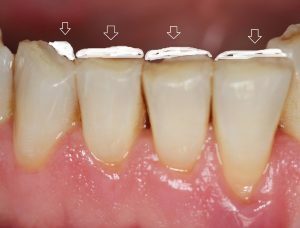 When clenching and/or grinding habits have been present over a period of time, the teeth will show wear patterns that your dentist can identify. Some of these patterns are described below. The teeth look flat. The teeth are designed to be sharp and cut food in the front and more rounded to grind food in the back. Excessive grinding can make the teeth appear plateaued. There are dimples. Excessive clenching can create dimple-like features in the cusps of the teeth called inverted cupolas. The roots look caved in at the gum line. 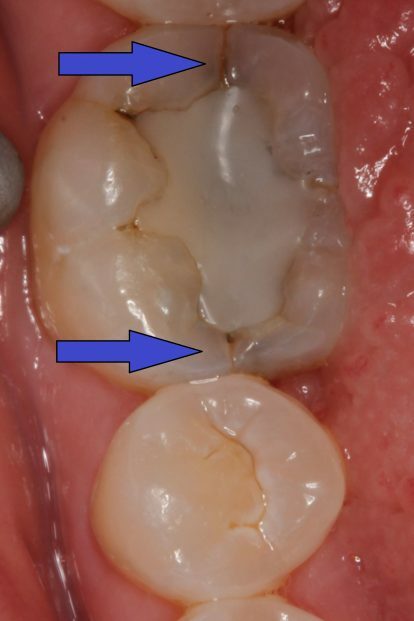 The tooth is especially vulnerable where the crown meets the root. Under pressure, the tooth will begin to change in a way that makes it look caved in. Fracture lines. 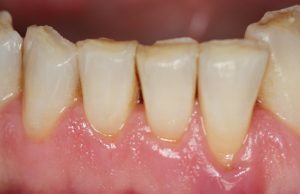 There are fracture lines in areas where the tooth is under extreme pressure. Active clenching and/or grinding habits can also make the jaw muscles feel very firm. Often it will be difficult to keep the mouth open for fillings and cleanings because the muscles are so over worked. WHAT ARE THE BENEFITS OF A NIGHT GUARD? A night guard can protect your teeth by interrupting reflexive patterns that cause clenching and/or grinding during sleep. It also provides a physical barrier so the night guard will wear down before the teeth. Wear from day and nighttime clenching can leave the teeth damaged and broken over time. Unsure whether or not you have a clenching and/or grinding habit? At your next cleaning and exam we can let you know if we see an signs of wear patterns and if a night guard could help you prevent damage.